The Alpina E21 Holy Grail? Thread: The Alpina E21 Holy Grail? ALPINA 2ND RESPONSE WAS EARLIER TODAY. I´m very sorry but ALPINA never developed a turbo 4-cylinder engine in the E21. Good story, but extremely wrong. This car/ad/story are a repeat. Don't remember how many years ago it was, but it was pitched like this once before and the story steadily picked apart then as well. I mean seriously, run the vin - it's a US-spec 320i!!! End of story. Good to hear from you. Hope the fleet survived Sandy, especially the Alpina's. Hey, good to hear from you, too. The Alpinas survived due to evacuation efforts, but many spare parts lost, and parts cars flooded, no matter how high they were blocked. 2-3 feet of water in the garages. Touch base next time you're up this way. Wow, the story is laughable at best. Alpina would not be concerned with development of a turbo system on a chassis on its way out, among the miriad of other obvious holes in the story. Finally, I would normally be very suspect if this information was 2nd hand or "my friend says that his friend says, etc." However, I know the guy who built it. I've known about the car for some time. People in SoCal who know the car and the original owner know and believe him...because, he has simply nothing to gain. This un-named engineer doesn't (most likely because he doesn't exist), but you sure do. "Somewhere the zebra is dancing." Why don't those of you who have questions pick up the phone and call me at 714-335-4911. In fact, why don't you google AutoKennel and my name Paul Kramer and see what kind of reputation we have. Better yet, why don't some of you come down to our shop and see what kind of business we run and look at the car. BTW, several notable magazine editors have seen the car and will be photographing the car for an upcoming article. They all know the car and the guy who built it. If you do enough digging on this car, you will run across the engineer who built it. His name is out there. It is on an old Alpina thread. Uhhhhh, I'm not going to "do enough digging on this car" as you suggested because... well, I'm not the one trying to sell this car for 30k. This all comes down to one man's word (the engineer) vs. the word of Alpina. I'm inclined to believe the company since they have nothing to gain either way. Maybe the engineer did work at Alpina and maybe he built this car, but that doesn't mean it's an official or even unofficial project of Alpina. If that is the case, I think the history still adds value to an already great car. But someone down the line decided to put a fake Alpina plaque on it and print up a fake build sheet, and that's not ok.
BTW, it's already out there on other boards, but the engineer in question is Kent Goldy. He is currently in a director position of Cosworth Racing's F1 Engine division. I believe he is pretty high up in the ranks there as he is at all the F1 races. Currently, he is in Spain for F1 testing. He's already been involved in that thread there, too. Google maps search a large house (which I would expect of a retired, presumably successful engineer) with a white e21 in the driveway. Read attached, You have any idea of just how many concept and feasibility study mules (prototype cars) the auto industry creates every day, yet all the experts in the forums will tell you that "they know better". May I suggest that you do not turn to these experts for auto repair either, you'd be better off using professionals like Jeff at TP Motorsports for broken cars. I wish you the best of returns in marketing your products. However, again please leave me out of this, I neither have the time nor interest. The Zombie Engineer from Texas. Correction To update the detective fool that pronounced that we lived Texas and I died in 1992. El Paso late 2000's while I was at MSD for all of 3 months til we decided we were not able to be local Tex-Mex transplants. But no mention of any Alpina connection anywhere. My error in omitting Alpina in quickly copying into a pdf to forward to you. It got cut off. I just went into the link and exported the .pdf. FYI For someone from your loyal fan club following were to do a real internet search / google of my name they will also discover I am infamous with creating Goldy's Law in Michigan 750.225 750.227 carrying a concealed weapon. I was an NRA CRDF recipient to help change laws. carrying that all the way to the Federal 6th Circuit Court of Appeals. That legal adventure was long time post 1992. As I have stated, all the comments you are forwarding from chat rooms are of no merit or importance to me. Finally, you have to think about the total scenario of "why there is any motivation to rip anyone off." Kent builds the car and owns it for 30-years. He doesn't care about the value and doesn't think it is worth much. He sells it a couple of years ago to my close friend Nick Reed. Nick owns the building where we (AutoKennel) are located. Nick was a close car friend of mine for 15 years. 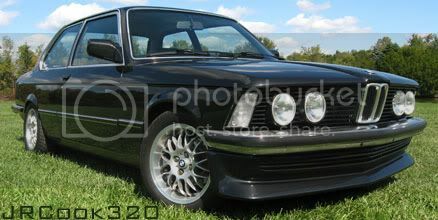 Nick only bought it because he has a 1967 Alpina and wanted something newer that he could use more as a "daily-driver." He bought it from Kent for around $12k. When he bought the car, Kent had just finished a bare metal repaint. Nick went on to spend at least another $10k finishing off the interior as well as building a custom A/C system for the car that looks vintage but works like new. As he was finishing the car, he was diagnosed with terminal lung cancer and had less than a year to live. Although I mostly deal with vintage Porsches, I told him I would help him sell it. I had a Porsche friend of mine who called me because he was looking for a clean E21 just like he had in college. However, most of them were either rat traps or totally hot-rodded out. He is a prominent LA attorney and wanted something he could drive in Traffic with the A/C on and have it drive like a nice BMW. He loved the way it drove and bought it. I didn't make any commission. I was simply helping a dying friend. A year later, the current owner (who has a large car collection) realized that his dream of driving the car a few times a week never happened and the car was just sitting. He drove less than 500 miles in one year. So, he asked me to sell it for him and he wanted it priced at $30k. I'm sure he will take less, but it is really his call. My commission is just a flat $2k regardless of what it sells for. This barely covers my advertising, detailing, insurance, and storage expenses let alone time. But, he is a good client and I don't mind helping him out. Finally, I have spent quite a bit of time with Kent as he came to our shop to work on some of his personal car projects. The guy has way bigger fish to fry than fabricate some story of days he worked at Alpina. Hell, he's worked for Ferrari, Ford, BMW and much bigger names. I had no idea that so many people would freak out about a car that I've driven, touched, and had dinner with the builder. BTW, regardless of what you believe or don't believe, this is really a very nice car that is very well done and arguably one of the nicer E21s on the road. That's fine if you want to continue to bash the car but I don't think it really helps any of you out in the BMW/Alpina community but rather portrays you as petty pontificators rather than open minded and encouraging enthusiasts. NOT ONE OF YOU has picked up the phone and given me a call or better yet come look at the car in person. I know some of you may be far away, but I'm also sure there are several local people as well. In the end, all of the negative banter hurts ALL of your cars. The big collectors (ones who buy $250k plus cars) will just look at this community and regard them as a waste of time and turn their head the other way rather than pursue an Alpina BMW for their collection. Such a shame. i quite like how the first pdf, which you say you "quickly exported to pdf", is what looks like a screenshot of the profile being edited. i signed up to linkedin to try and view the profile link you posted earlier, and it took me all of 2 minutes. I met Paul 2 years ago while i was waiting to meet Jeff of TP motorsports for the first time at his showroom, very friendly and accomodating. His clientelle are mostly Newport Beach millionares in the OC area, i don't think his business will flourish like it is if he is not honest. I've seen the car personally and it is awesome. He's also from HB so he must be cool as well. Keep your chin up Paul say hello to Jeff for me. Just curious, but if he knows this E21 is 1 of 2, then he must know where #2 is? Perhaps if #2 looks like this one, then this one might not smell like #2?